The Day of the Duck by artist Helen Stratford and Lawrence Bradby, explores Englishness, pseudo public space and what it is to be considered an unwelcome migratory visitor in contemporary Britain through the eyes of a particularly pesky Muscovy duck. In a small Fenland city, a challenge has rung out: TAKE BACK CONTROL OF OUR COUNTRY! In the wake of this vague divisive slogan things have gone uncannily quiet as difficult questions persist, unanswered. Into this truculent atmosphere, with a slow pit-pat-paddle-pat, comes a Muscovy duck, who in a quest to discover the whereabouts of its ‘disappeared’ brethren, follows a trail of clues, that take our duck-tective through the complex spatial habits and prejudices of the locals. Sticking its beak where it's not welcome, our web-footed gum-shoe discovers how small daily acts in public space offer both opportunities and challenges to new arrivals, to those perceived as different, un-deserving or just plain foreign. But as Philip Marlowe would tell you, for those who root about for answers and question prejudice, a Mickey Finn or a blow to the head is never far away... 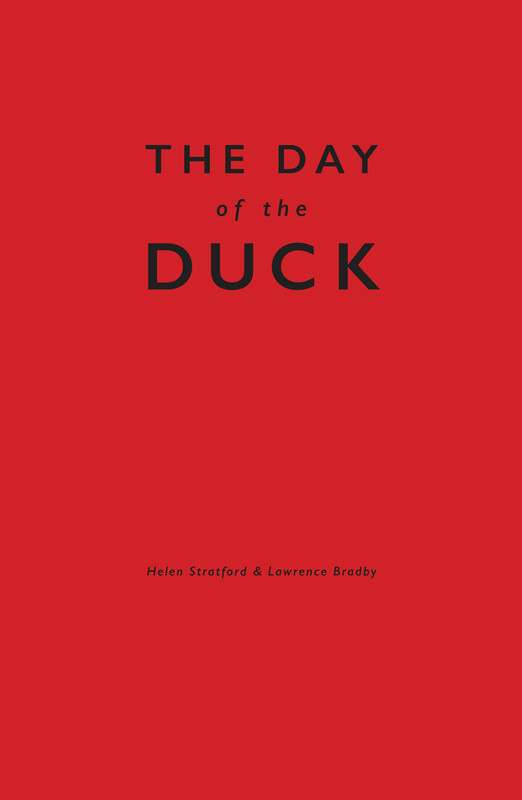 The Day of the Duck by Helen Stratford and Lawrence Bradby, explores Englishness, pseudo public space and what it is to be considered an unwelcome migratory visitor in contemporary Britain through the eyes of a particularly pesky Muscovy duck. Helen Stratford has exhibited at Oriel Davis and g39 Gallery, Wales, Celje Centre for Contemporary Arts, Slovenia, IMT Gallery, London, Wysing Arts Centre, Cambridge and is currently completing an artist’s walking residency at Yorkshire Sculpture Park. She was born in Bath and lives in a village in the Fens. Lawrence Bradby, as part of the family art practice Townley and Bradby, has exhibited at MK Gallery, Milton Keynes, at Royal Standard, Liverpool and at The Minories, Colchester. He was born in Glasgow and lives in Norwich. Graphic design: Paul Oldman of Smith Design. Series editor: Gordon Shrigley. Size: 145 x 223 mm. Print: black and white with 25 colour illustrations. Pages: 128. Binding: Hardback. Limited edition Artists' Book of 500 copies.